1. Thank and link back to the person who awarded you this (award). Done! 2. Share 8 things about yourself. Look below. 3. Pay it forward to 8 bloggers that you have recently discovered. Look below. 4. 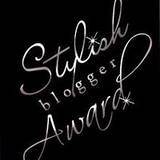 Contact those bloggers and tell them about their awards. Yes mommy. Thank you so much Mrs. Green. I'm glad you found me. Hopefully you'll come back and visit. 1. I am the wife of one and mother of four ages (13, 8, 7, & 5). 2. I've officially lived in six different states and I'm not military. 3. I worked at the '96 Olympics in Atlanta, GA as a Medical Runner at the Aquatic Center. I met quite a few interesting people including Hilary Clinton and Greg Norman. 4. In my professional career and because of moving, I've had six different jobs including a Medical Disability Adjudicator. I recently taught school for the last 5 years before retiring at the ripe ol' age of 35. 5. I was blessed with a all expense paid trip to Israel in 2000. I won it off of an national radio contest. 6. I officially started scrapping in 2005 after my husband presented me with my first album that he created himself. 7. My mother taught French and because of that, I've been blessed to travel to Canada, France, Italy, Switzerland, Monaco, Spain, and England. I love that your husband made you an album. That is the sweetest thing EVER! Aww Thank you so much. I appreciate it. Right back at ya!!!! Hey cool.. is this what you were speaking about??? Ok Thank you again. My post isn't showing up!! I've been working on my post though!!! whew hew. Congrats on your blog award! What a cool way to discover scrapbooking - from your hubby!